Option 1: Place them on a baking tray (lined with tin foil or a baking sheet) and roast for 20 minutes (200 ⁰C). Take them out and let them cool off before skinning them and taking off the membranes. Option 2: Cut the fresh peppers into bite size pieces and add to a large bowl. Option 3: Use both fresh and roasted peppers. Wash tomatoes and cucumber. Cut them into chunks. Wash & finely chop the parsley. Peel the onion, half it and slice each half. Separate each slice. Add all the vegetables to the bowl, including olives. Finally, add Feta cheese (Use hands to crumble it or place it in a bowl and use a fork). Finally, add olive oil and vinegar. Mix well and top with some more crumbled Feta cheese. Serve as a starter or as a side dish with some grilled meats. 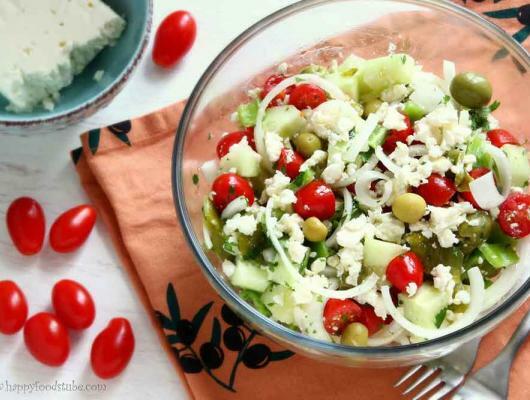 Shopska salad is a delicious Bulgarian cold starter that can be also served with grilled meats! This salad is also well known in many other countries such as Macedonia, Serbia, Croatia or Romania. 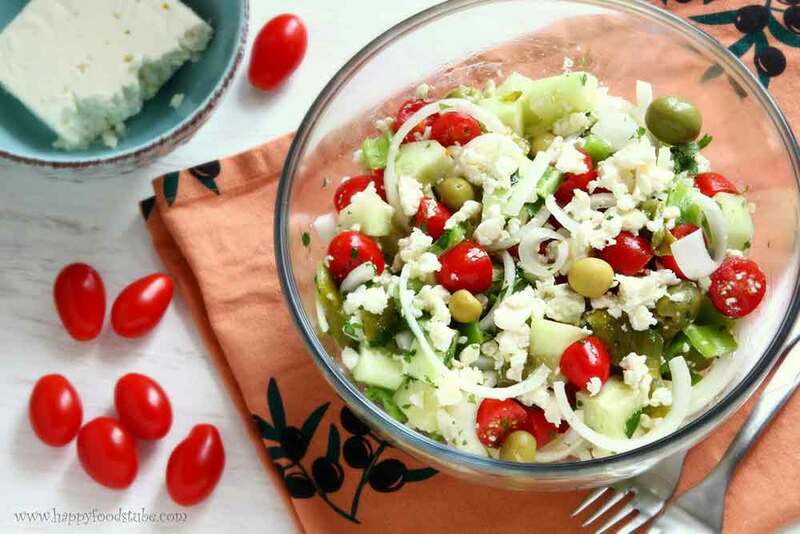 Tomatoes, peppers, olives, cucumber & onion mixed with Bulgarian cheese (or Feta cheese), fresh parsley and olive oil. Top it with some more cheese and you are good to go!